On the face of it, the Dell G3 is the most ordinary-looking gaming laptop if I ever saw one. For starters, it has no freaky logo or emblem on the lid like, say, an Alienware would. And then, the keyboard (or even the area around it) doesn’t scream gaming or rebellion. Instead it settles for a subtle crosshatch pattern that makes it look very business-like. That said, the numbers on paper look good. This particular model in review is the G3 3579. It has an eighth-gen Intel Core i7 CPU, 8GB of RAM, and an NVIDIA GeForce GTX 1050 Ti to handle graphics. Storage is taken care of by a 128GB solid-state drive and a 1TB hard drive. Let’s see how the laptop fares in the real world. 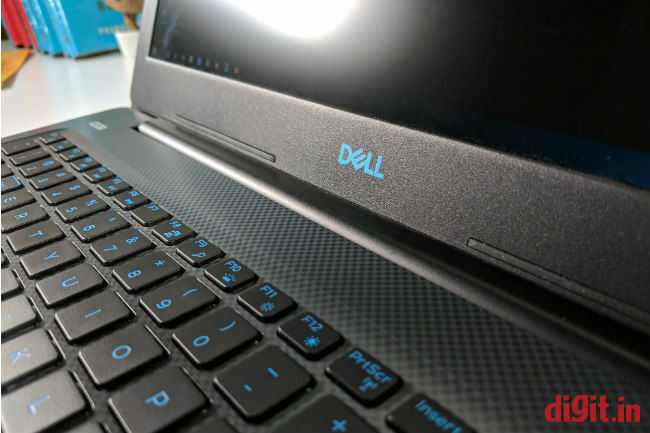 There’s nothing particularly striking about the way the Dell G3 looks or the way it’s constructed, which is generally not the case with many gaming laptops. The large 15-inch body is made of matte-finish plastic that looks hard-wearing and reliable. The laptop is grippy enough to be held confidently from any angle but needs some muscles to get there. The G3 weighs a solid two and half kilogrammes, which is on the heavier side even for a gaming laptop. 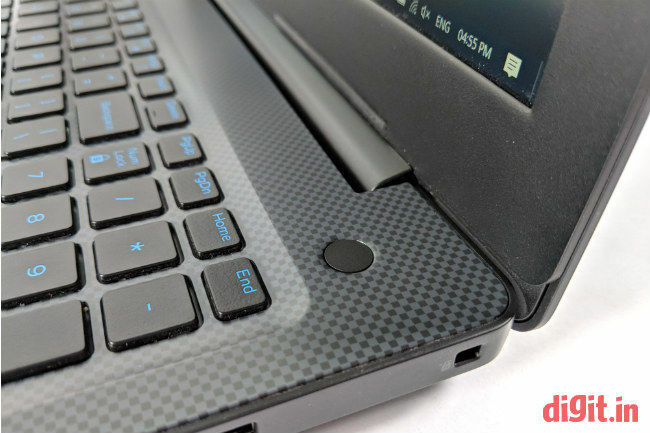 The neat black lid of the laptop is a fingerprint magnet. In the middle of it, we see a Dell logo but in blue shade, presumably to distinguish it from the Inspirons and the Vostros. The lid can be opened with the push of just one finger. On the inside you’ll find a 15.6-inch matte-finish screen surrounded by thick black bezels on all sides. The area around the keyboard and touchpad is neatly crosshatched and has a single etched label that reads ‘G3’. 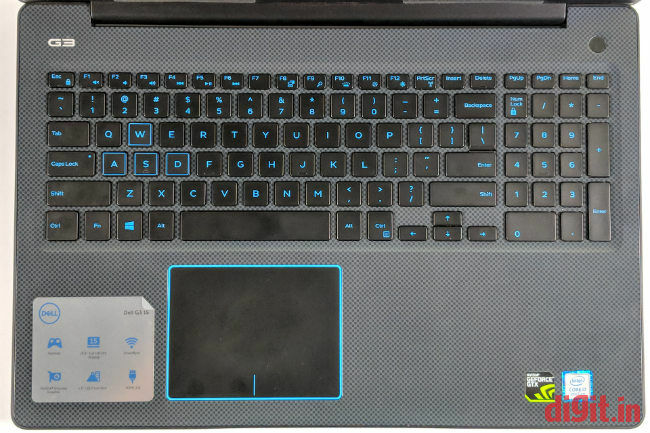 The letters and symbols on the keyboard and the nice, thick border around the touchpad accented in lightning blue colour stand out against the dark shade of the rest of the body. 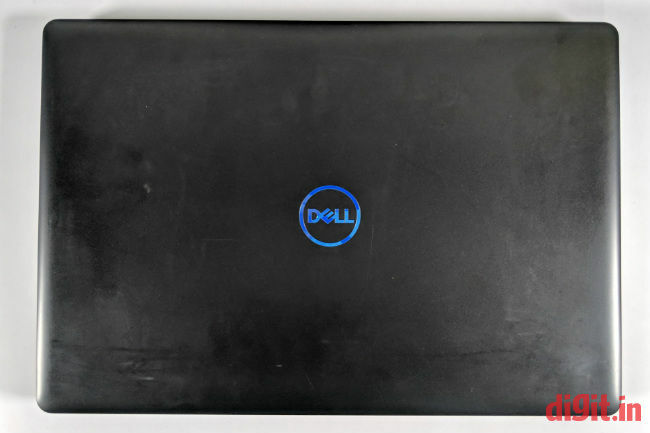 In summary, the Dell G3 seems to be a gaming laptop in an Inspiron’s clothes. But that’s not a bad thing, considering it’s built quite sturdily. There are moments when the laptop’s bulk becomes apparent, but it’s still excusable given that the size of its display is 15.6 inches and not 14 inches. The Dell G3 has a 15.6-inch Full HD IPS display. Colours on the display are on the warmer side and often appear washed out. Our tests show that the display is capable of producing only 67 percent of the colours in the sRGB colour scale and 51 percent of the colours in the Adobe RGB colour scale. Though matte in finish, the display allows for a lot of light reflection, which makes not just reading but even gaming hard at times. The display folds back only up to around 130 degrees. Though it’s an IPS panel, reading from a horizontal angle of 45 degrees becomes a challenge. It has a refresh rate of 60 Hz, which is half of what the Asus TUF FX504 offers. Dell, sadly, has not specified the display’s response time. It has however reported a maximum brightness of 220 nits. In my experience the display mostly seemed bright enough for most indoor and outdoor spots. If anything, it could have been a bit brighter. On the whole, the display quality on the Dell G3 is well above average but could’ve been far better in terms of colour reproduction. Audio from the two down-firing speakers is crisp but lacks bass. Volume is enough to fill a quiet conference room of say, 20 x 25 feet. In-game sounds are heard clearly while playing games in an open office space. The volume is enough to catch the attention of nearby colleagues. When a pair of headphones is plugged in, a pop-up asks you which type of audio device you’ve connected to figure out how best to deliver sound. Mind you, this pop-up will appear only if the Waves MaxxAudio audio driver installed. The Dell G3 has a body wide and deep enough to house all necessary ports. On the left side, it’s got a round-pin power port, a full-size HDMI port, an ethernet port, two SuperSpeed USB 3.1 ports, and a 3.5mm audio jack for headsets. On the right side, it’s got a USB 3.1 port and a full-size SD card reader. There’s also a laptop lock slot on the right side but it’s not the Kensington Security Slot; it’s the Noble Lock Slot. Look around the sides all you want but there isn’t a single USB Type-C port in sight; clearly, Dell has gone far to keep costs low. Interestingly there’s only one LED indicator on this laptop and it sits next to the power port. The circular power button in the area above the keyboard doubles up as a fingerprint scanner. This unit here is easily the fastest fingerprint scanner I’ve ever seen on a laptop until now. It works with Windows Hello to authenticate a fingerprint in less than half a second almost every single time you thumb it. Though the laptop’s base is thick, the keyboard on the Dell G3 is a shallow one. The keys on it are flat. They travel very little when pressed, which makes typing an uncomfortable experience to say the least. I found myself making numerous mistakes and double strokes simply because the keys didn’t offer enough feedback. On the bright side, the keyboard comes with a number pad and dedicated keys for Page Up, Page Down, Home, and End functions. 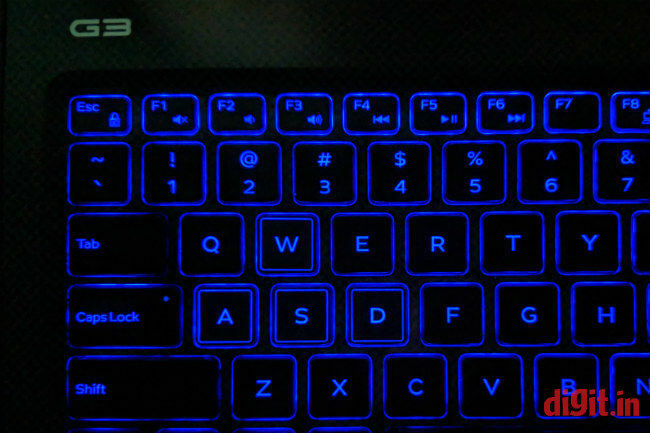 The entire keyboard is backlit in blue colour and the WASD keys have a subtle blue border around them. No RGB backlight customisation is available on this model. The touchpad experience, fortunately, is much better than the keyboard experience on the Dell G3. The touchpad, being a precision unit, allows the user to make modifications to the tap and swipe actions straight from Windows Settings. No other third-party driver is required to make the touchpad functions work. It must be mentioned that on the review unit, Windows did not recognise the touchpad as a precision unit until the Intel chipset driver was manually installed. In summary, the touchpad works well (like any other precision touchpad) but that’s more than can be said for the keyboard. I wish the keys travelled deeper and offered more feel. This shortcoming, luckily, is not noticeable while playing games. Punching WASD and other related gaming keys furiously is a relatively easy affair. Key spacing too is adequate for first-person and third-person player games. That said, I would not recommend this laptop’s keyboard for anything more than an occasional email or note. The Dell G3 is powered by an Intel Core i7-8750H CPU running at 2.20GHz and 8GB of RAM. Storage is taken care of by a Hynix 128GB SATA solid-state drive working in conjunction with a Seagate 1TB hard drive that spins at 5400rpm. The CPU can be pushed up to 4.10GHz with Intel’s Turbo Boost technology. The solid-state drive can be replaced by a SATA SSHD (up to 1TB) or be upgraded to an M.2 solid-state drive with a PCIe NVMe interface (up to 512GB). RAM can be upgraded to 16GB per slot and the Dell G3 has two SODIMM slots inside. 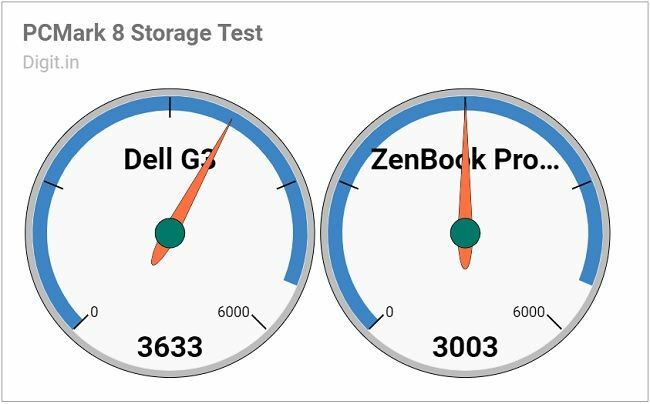 On benchmark tests, the Dell G3’s scores are similar to those of the Asus ZenBook Pro 15. 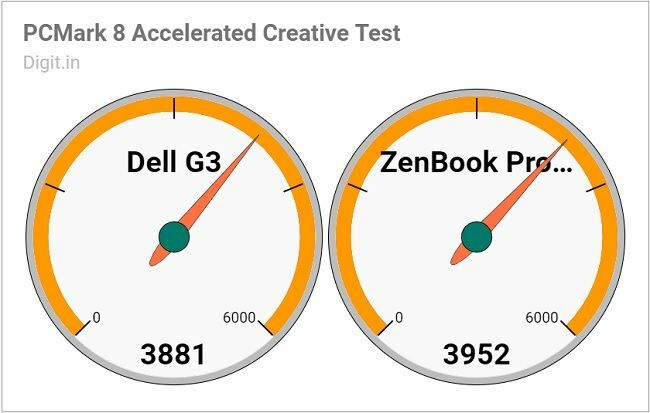 On PCMark 8’s Conventional Creative test, the G3 is only 71 points below the Intel Core i9-powered ZenBook Pro 15. In tests like 3DMark’s Fire Strike Ultra and Fire Strike Extreme, it even surpasses the Asus by a hundred points or so. It leaves the Asus biting its dust with tests like 3DMark’s Sky Diver and Cloud Gate. Like its benchmark performance, the Dell G3’s real-world performance is more than adequate. The six-core i7 CPU is capable of exporting a hundred RAW images to JPG files in ten straight minutes using Adobe Lightroom. Running ten or more applications simultaneously across several virtual desktops is no problem on the Dell G3. You won’t face any undue delays while launching fat applications like Google Chrome and Apple iTunes. There is a slight problem though. While outright speed is never an issue with the Dell G3, the mouse pointer freezes for just a few seconds when an application is launched. When headphones are plugged in, the audio also freezes during these few minutes. Apart from this one glitch there’s little to complain about on the performance front. The momentary freezing is most likely the result of a faulty RAM. Graphics on the Dell G3 is taken care of by an NVIDIA GeForce GTX 1050 Ti GPU with 4GB of GDDR5 dedicated video memory. From a laptop whose price tag climbs all the way up to Rs 83,790 it’s not unfair to ask of an NVIDIA GeForce GTX 1060 GPU. Nevertheless the Dell G3 fares very well while playing games like Doom and Metro: Last Light. With the resolution set to the device’s maximum (1,920 x 1,080 pixels), supersampling set to 4x, tessellation set to normal, and overall graphics set to Medium, Metro: Last Light ran on the Dell G3 review unit at an average frame rate of 90 frames per second, which is healthy. Pushing the overall graphics to High caused the frame rate to plummet to 26 frames per second. Pushing it further to Very High caused little difference as the frame rate hovered around 25 frames per second. With all graphics settings on Doom set to Ultra and the resolution set to the laptop’s maximum (1,920 x 1,080 pixels), the Dell G3 rendered a slow, shaky, and blurry video at 12 frames per second when it was played on battery power but instantly rose to 60 frames per second when the power cord was connected. Heat, I felt, on the Dell G3 was handled deftly as I was able to play Metro: Last Light for a period of over thirty minutes without feeling any heat on or around the keycaps. The two fans on the base of the laptop kicked in only some ten minutes into the game and didn’t run at all otherwise. On the whole, performance on the Dell G3 is pretty good. Games load up sufficiently quickly despite relying on a hard drive that spins at 5400 rpm. What’s a little annoying to deal with is Dell’s large suite of bloatware. The laptop comes installed with apps like Dell Mobile Connect and Dell Power Manager that regularly pop up after a boot. Such downloads could have been left optional in my opinion. On our benchmark test, the Dell G3’s battery performed phenomenally well. It lasted 4 hours, 3 minutes on the PCMark 8’s standard battery test, which is over one and a half hours longer than the Asus ZenBook Pro 15. Clearly, the Dell’s 4-cell 56Whr integrated battery is a hard worker. During everyday use, the Dell G3 manages nearly five hours on a single charge if you only making it handle documents and spreadsheets. Ask it to do some heavy lifting like installing an Adobe application using the Adobe Creative Cloud and you’ll see the battery drop from 100 to 34 percent in 1 hour, 45 minutes. Considering the fact that it’s a gaming machine hungry for power, a battery life four to five hours is decent. The Dell G3 is a subtle-looking entry-level gaming laptop for those who don’t want to play very graphics-heavy games. The laptop is nearly Rs 10,000 more expensive than its competitor, the Asus TUF FX504, but offers nothing more than the Core i7 CPU. Otherwise the RAM, the GPU, and the storage devices remain the same. It’s even heavier than the Asus by nearly 230 grammes. All things considered, the Dell G3 offers an acceptable gaming and computing experience for its rather hefty price tag. It’s got its own quirks that might make you dislike the machine but you’ll still find more things to like in it.